I'm an avid reader and so I thought that my blog would be the perfect place to tell you about some books that are unforgettable. An opportunity arose with Taboo by Thomas Piggott and I knew from the title that it would be a good read and I wasn't disappointed. This book is fascinating and heart-breaking all at once. It's an eye-opening book into the reality of the horrendous childhood abuse at the hands of person who was thought to be trusted and a friend. Thomas Piggott depicts the survival techniques of a young child and despite it all having the amazing ability to survive circumstances that are beyond imagining. 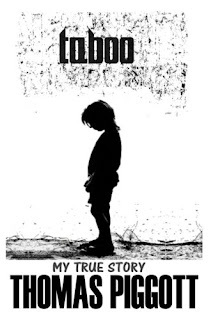 Set in the Midlands during the 1970s, Taboo tells true story of Thomas Piggott who as a child was subjected to the most brutal sexual abuse imaginable and by a person who was supposed to be a trusted authority. But it also follows Thomas into adulthood, highlighting how the pain and emotional damage caused by the abuse caused a domino effect into his life. The book begins with Thomas Piggott explaining why he's decided to share his story and what he hopes to gain from writing down all his thoughts. In a unique way, writing his book acted like a type of therapy where by sharing his story he could help others who have been through child abuse to feel less alone and to speak up. You have to admire the courage that Thomas has with Taboo as it couldn't have been an easy writing about your life for the whole world to see. As I have said Taboo immediately grabbed my attention. But I do have to be completely honest and say that some parts of the book I found quite difficult to read, due to the narrative nature of the story it did seem to jump from one thing to another. I understand that this book is a true account of a victim of child abuse and therefore it cannot be so clearly set out, chapter by chapter, but this alone cannot detract from the serious focus of the book. In my opinion this book teaches you about child abuse through an unforgettable account. But it also teaches you about the seriousness and the effects that child abuse can have on an individual creating a domino effect into their adulthood. Thomas is so courageous to write about his life experiences. No one should have to go through that pain, but unfortunately it does happen. This books goes into quite graphic detail about the child abuse which can be hard to take at times, whilst reading I wanted to put it down because it made me so angry. Beware it's an emotional one! But even though at times it was graphic, I don't think that it would get the same reaction from it's readers if it was sugar coated...it's very real. Sadly, I believe that many people will be able to relate to Thomas and his life story. Child abuse is something that no one ever wants to share however over recent years it happens more than we all realise and usually by someone who thought could be trusted. I would like to think that because Thomas Piggott found the courage to share his personal experiences of his childhood it may give his readers who may have been through similar experience the courage to speak out. Overall, I would have to say that Taboo is an unforgettable book and reading this certainly put me on an emotional rollercoaster. At times it was hard to read due to the sheer descriptive nature but also because it's jumps from one thing to another. It's reasonably fast-paced with plenty going on with a select few characters that play a crucial part for Thomas Piggott and his life. Nonetheless it's an unforgettable read and I would give this a rating of 4/5. You can buy your copy on Amazon and it's currently retailing at £6.99 and twenty per cent of royalties will go to Children In Need. 4 comments on "BOOK REVIEW | Taboo by Thomas Piggott"
I think that Thomas was very brave in sharing his story with everyone, but conveys a strong message through this book by letting people know that they are not alone. I want to read this. I find real life stories and very interesting. In another world if my health was better I might had gone on to be a counsellor. I imagine it would be a difficult read but one that raises awareness. Oh yes most definitely! That would be the kind of profession I would have loved to go into, I can imagine that being a very interesting career!